One burger with the lot, a slice of pineapple, an egg and grease dripping down your chin. Here are a few burgers joints around Melbourne flippin' some juicy patties. Once upon a time many would have argued that the best burgers came from the US. They of the oversized portions, drawling vowels and dancing president fame would easily trump the Aussie version even if Hungry Jack’s insisted that the burgers are better at theirs. Tracking the history of the hamburger could take us down a number roads, but certain its popularity grew from the simple fact that this was a hand-held meal that was cheap and eaten with ease between two pieces of bread. Essentially the burger is the ultimate sandwich. Sticking to the old-fashioned way of making burgers and using quality Aussie beef prove to be a winning move for many places around Melbourne which are fast becoming the shining beacons for hamburger devotees. A handful of burger joints now serve up traditionally greasy goodness sandwiched between toasty buns and topped off with an assortment of sauces so good you’ll wonder why you ever thought you had to leave the country to get your hands on these wonderful treats. So we’ve put together a list of a few spots around Melbourne we think are flipping some pretty good patties. 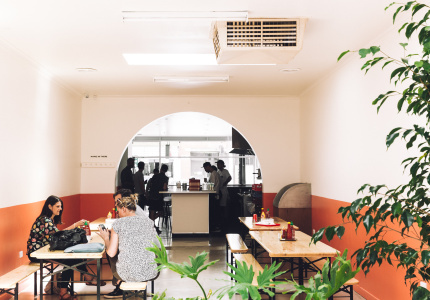 Misty’s Diner in Prahran serves burgers with that little bit extra on the sides – it's a 1950s diner-style restaurant with mini jukeboxes at every table, checkered floors and squeaky leather booths. Their original burger Misty’s American Style is on the map – thick slice of bacon, fried egg, American cheese, lettuce, tomato and lightly fried onions top a juicy beef patty that’s got that distinctive tang to prove it is only fresh, quality minced beef they’re using. And they’re not shy when it comes to piling on the tomato sauce either. 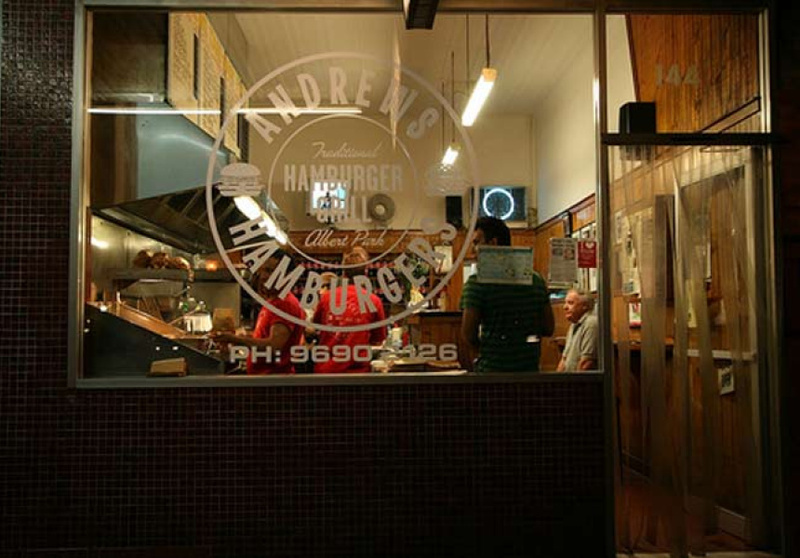 While we’re talking about the hamburger with the lot, Andrew’s Hamburgers in Albert Park comes to mind. Its Traditional Beef With The Lot boasts the usual suspects of juicy slices of bacon, fried egg, lettuce, cheddar cheese, tomato, caramelised onions and ground beef patty, all perfectly complemented by the wonderful sesame buns. And despite the very basic ‘fish and chip shop’ interior, just take one bite and you’ll see why it has been noted on most ‘best burger’ lists for years. You’ll also find yourself with meaty juice running down your chin, so grab a napkin for this one. 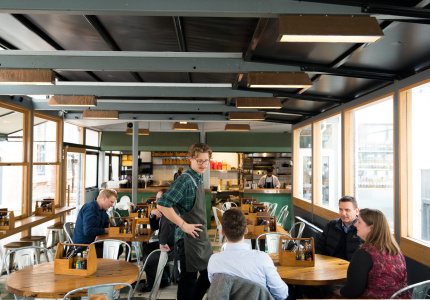 Another spot that is more about the burger and less about fine dining is North Fitzroy’s Danny’s Burgers. Yet another modest but equally popular establishment, Danny’s have been specialising in hamburgers for over 60 years. And special they are – choice-cut bacon strips laid out lovingly atop a seared beef patty garnished with lettuce, tomato, cheese and tomato sauce sandwiched between lightly grilled buns. Simple but worth travelling a little bit further out of the city for, at almost anytime of the day. 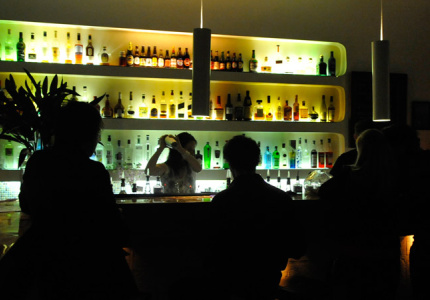 They’re open until 2am some nights, so they become a hot spot around midnight with hungry drinkers with empty bellies. But rather than going to them, why not let the burgers come to you. That’s Beatbox Kitchen’s style with their mobile burger van with a boombox painter on the exterior. 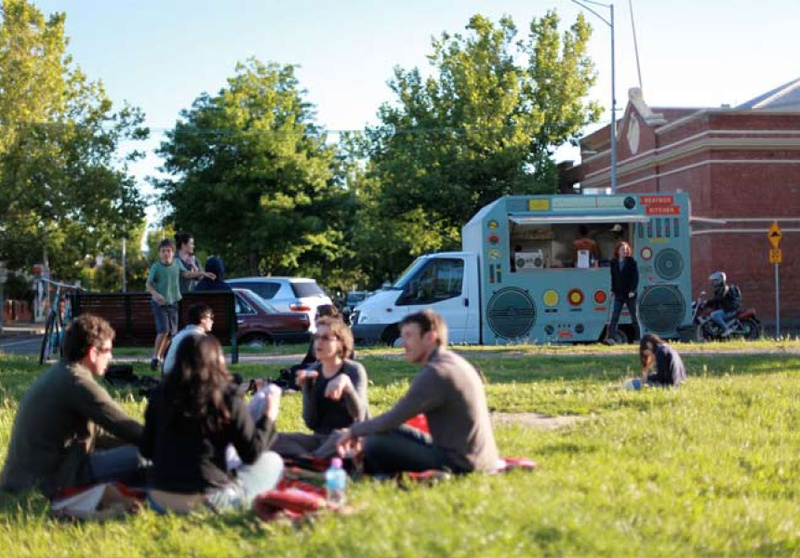 Founded by owner Raph in late 2009, the Beatbox Kitchen has been a permanent fixture at community events and festivals mainly around north-eastern Melbourne, serving quality comfort food like hearty fries, fresh chicken wraps and of course, hamburgers. 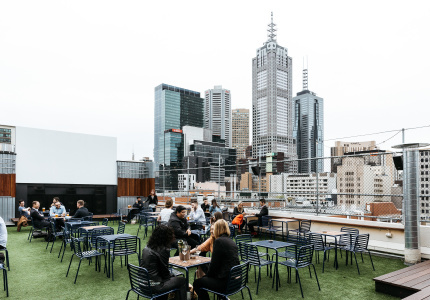 Although there is a catch to this – like the nature of the business, Beatbox Kitchen’s Raph Burger is pretty elusive, so if you can’t wait 'til the Beatbox Kitchen stops in your neighbourhood, head to their new permanent fixture at the Rooftop Bar in the city. While you’re in the city, there are some other well-known establishments serving a most deliciously burger, namely Trunk Diner and Roozervelts. Trunk Diner – a division of the original Trunk Bar & Restaurant– opened in July this year and are known for serving up American diner-style burgers with generous amount of cheese (choose from either Monterey Jack, Gruyere, Cheddar and Raclette) melted over a lightly seasoned Wagyu beef patty and garnished with pickles, tomato, cos lettuce and tomato sauce. Meanwhile, one little corner pocket of the city that you may have walked through a bunch of times but never spotted is Roozervelts, in the Collins Place food court. 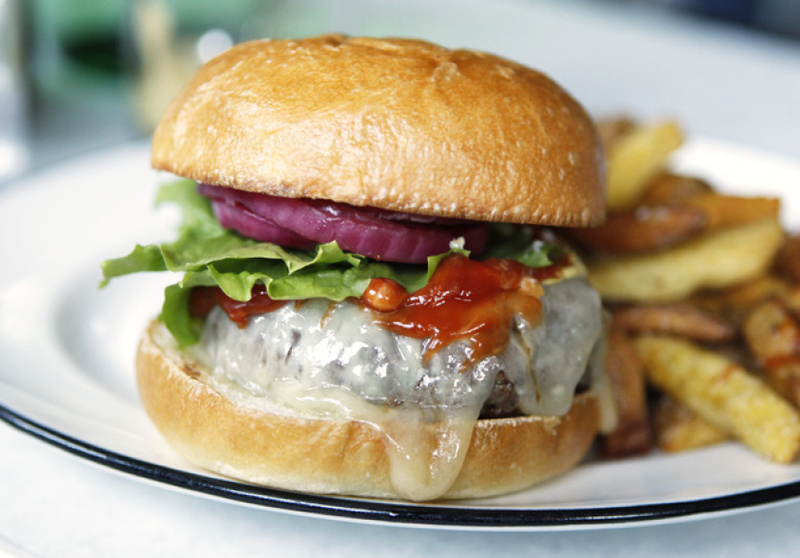 Roozervelts serve up hamburgers with their own twist – their cheese is not melted. Rather than having the cheese melted on top of the beef patty, Roozervelts’ The Lot sandwiches the cheese between the bun and the egg instead. The buzzing noise of the surrounding food court serves as an ample distraction to the dripping grease that’s sure to stain you blouse and ensure a dry-cleaning bill to boot. Maybe that’s a prerequisite and a small price to pay when you’re a true hamburger fan.